Everyone likes to be beside the seaside at this time of year. But, as a dedicated dog owner, would you know the best beaches in the UK to take your pet for a fun and safe day out? Our writers — acting on suggestions from customers and staff — have scoured the country to provide you with the most comprehensive guide ever to dog friendly beaches. All those featured are within an hour’s drive of a Vets Now clinic or hospital so, if you’re at the beach in the evening or weekend and suffer a pet emergency, you know you’re never far from expert help. We’ve only chosen beaches where parking and access is good, a daytime vet is based nearby, water quality is deemed high, dogs are welcome and a Vets Now pet emergency service is within driving distance. The vast majority of dog friendly beaches featured have also won awards for cleanliness and the facilities on offer. That’s not all though. To help you really make the most of your day at the coast or, better still, weekend away, we’ve included information on dog friendly hotels and dog friendly restaurants where your pet will be as welcome as you. Some might even dog-sit so you can enjoy a night out. 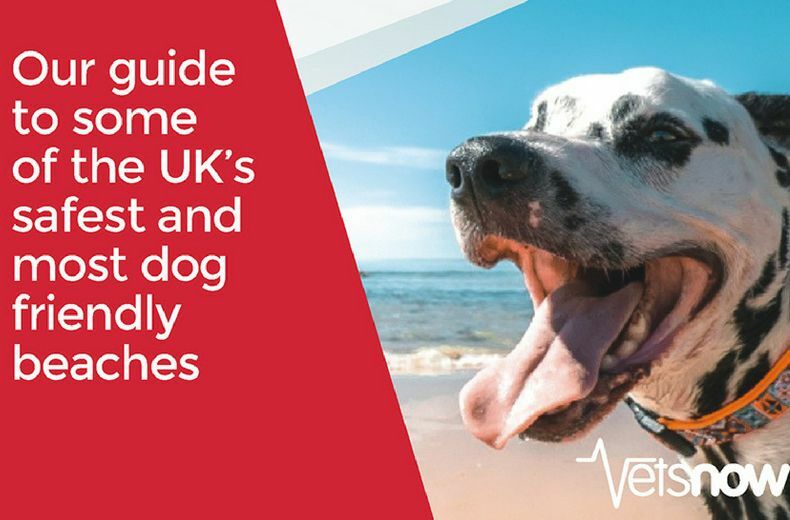 As Britain’s leading pet emergency service, we’re passionate about the health and wellbeing of all animals so we’ve also compiled a checklist of tips to help make sure you and your dog have a fun and safe experience when you go on your trip. Wherever you live in the UK, or wherever you go on holiday, we’re confident you and your dog will find a beach you’ll love in our special 32-page guide. Our guide includes dog friendly beaches in Wales, Scotland, Northern Ireland as well as various regions of England, including Essex, Kent, Pembrokeshire, Yorkshire, Norfolk, East Sussex, West Sussex, Lancashire and Merseyside.